Special Containment Procedures: SCP-3253-A is to be kept in a standard humanoid containment cell and provided with adequate enrichment according to established Ethics Committee Protocol. SCP-3253-A is not permitted to come into contact with SCP-3253-C. SCP-3253-A may come into contact with SCP-3253-B under supervision and for no longer than 60 minutes at a time. SCP-3253-A is not permitted any object that can be sharpened to the point of cutting or damaging skin. SCP-3253-A is to undergo quarterly psychological profiling to avert the formation of suicidal tendencies. SCP-3253-A's fingernails are to be kept short to prevent obsessive scratching of its skin. SCP-3253-B is to be kept in a standard humanoid containment cell on life support. Medical personnel assigned to tend to SCP-3253-B are to be kept under supervision during treatment. SCP-3253-B is not permitted to come into contact with SCP-3253-C.
SCP-3253-C is to be kept in a standard Secure Storage Locker and may only be removed for testing. Description: SCP-3253 is a phenomenon which manifests only when SCP-3253-B tattoos an image onto SCP-3253-A's skin using SCP-3253-C (hereafter referred to as 'A', 'B' and 'C' for brevity). The image tattooed must resemble in some way an object, person, time, place or phenomenon with which A has come into contact and which A can recall without the aid of mnestics or veritants. Once B considers the tattooed image to be completed, the object of the tattoo will spontaneously cease to exist as an independent object, and will instead become part of A. Destroying the image physically returns the object to existence (see Experiments 08, 10 and 11). Subjects returned in this fashion appear to suffer a sympathetic effect related to the method used to destroy the image. SCP-3253-A, previously D-4423, is an Asian male of mixed American and Japanese descent in its mid-forties identifying as Kimotsuki Tadahashi. 87% of A's body is covered in tattoos of varying design. 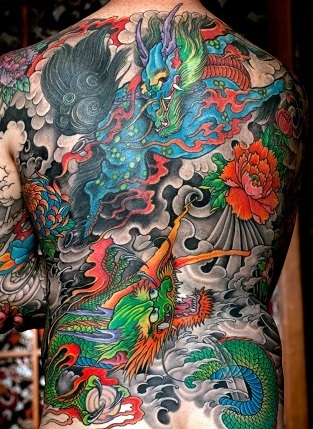 A claims to have obtained the majority of these tattoos during its time as an operative of the 任侠団体 (Ninkyo Dantai, or Yakuza), working for the 住吉会 (Sumiyoshi-kai) group in Tokyo. A came into Foundation custody after its arrest in Tokyo in 20██ for the murder of a local businessman and his family. SCP-3253-B, previously D-8779, is an Asian male of Japanese descent in its late forties identifying as Takuji Matsuda. B has been in a comatose state and under necessary life support since Incident 3253-4. B is known to have previously been a tattoo artist in Tokyo, and came into Foundation custody in 20██ after a sting operation conducted by the Japanese police implicated B in a series of murders. SCP-3253-C is a crudely manufactured tattooing needle created by B during its time as D-Class personnel. C is constructed from a wooden peg, a sharpened bone needle of animal origin, and twine obtained from Foundation stationary. SCP-3253 was first noticed by the Foundation after Incident 3253-2, in which SCP-████ vanished from containment at Site ██ on ██/██/20██. SCP-3253 was then retroactively identified as the cause of Incident 3253-1, in which [REDACTED] similarly vanished from containment at Site ██. The inquiry into Incident 3253-2 found that the only connection between the two incidents, other than the method of containment breach, was that A had been recently subjected to testing with both objects. A was removed from D-Class habitation and interviewed. Relevant sections of the interview logs are reprinted here. Foreword: Interview originally conducted in Japanese owing to D-4423's fluency compared to English. Original transcript available on request. Interview conducted on ██/██/20██, two days after the report on the inquiry into SCP-████'s containment breach was published. Researcher Yuji: Good afternoon, D-4423. I have been requested to ask you a few questions about your testing with [REDACTED] and SCP-████. D-4423: I don't wish to discuss [SCP-████]. Researcher Yuji: Yes, I understand you had an adverse psychological reaction when exposed to the object. Very well, we will begin with [REDACTED]. You were part of Dr Wilson's tests on prolonged contact with [REDACTED]. From what I can see, you did not suffer any ill effects from this testing. Researcher Yuji: Is there something you would like to add? D-4423: After twenty-four hours with that thing I couldn't sleep for five nights. I saw it whenever I closed my eyes. I heard it speaking in the dark after the lights are put out. I would lie down and feel it on my chest, choking the breath out of me. Researcher Yuji: You made no mention of this at the time, or in subsequent psychological profiling. We could have administered amnestics to you. D-4423: And end up with a bullet in the back of my neck come the end of the month? I'm only telling you now because I've been dragged in here. If these are my last words I might as well say what I want. Researcher Yuji pauses for 6 seconds and looks down at his papers. Researcher Yuji: Site medical records indicate that you obtained a tattoo of [REDACTED] shortly after testing. From your previous interviews I am given to understand that you… 'collect' tattoos. Is this for symbolic reasons, or simply to remember events in your life you consider important? D-4423 pauses for 4 seconds. Researcher Tange gestures for him to continue. D-4423: I thought that if I could get it out of my head and onto my skin I could… 'kill' it. It could join the others. Researcher Yuji: Our records show that [REDACTED] disappeared from containment shortly before your monthly check-up, at which the new tattoo was first noted. Before now, did you have any knowledge of [REDACTED]'s loss? D-4423 expresses shock at the statement, and nervously glances at his right arm, currently covered by a grey jumpsuit. D-4423: No, I was not aware. D-4423 rises from their seat and is clearly expressing fear. He has reflexively grabbed his left forearm and is squeezing it tightly. Researcher Yuji: You did not know? D-4423: Where is it? Am I safe? Researcher Yuji: Please, sit back down. SCP-████ has… been lost from containment. We have reason to suspect you are the cause. D-4423 refuses to co-operate further with the interview and begins pounding on the door to be let back into D-Class habitation. Closing Statement: Interview terminated and subject was forcefully pacified by security staff. While short, this interview establishes D-4423's fear of SCP-████ and [REDACTED], and verifies that he had no prior knowledge of their escape from containment. SCP-3253-A was given a medical check-up the following day and the tattoos representing SCP-████ and [REDACTED] were identified and photographed. In another interview, A revealed the identity of SCP-3253-B (D-8779) under duress. B was subjected to interview by Researcher Yuji. Foreword: Interview originally conducted in Japanese owing to D-8779's fluency compared to English. Original transcript available on request. Interview conducted on ██/██/20██, seven days after the report on the inquiry into SCP-████'s containment breach was published. Researcher Yuji: Good morning, D-8779. The purpose of today's interview is to discuss your artistry. I understand you were a horishi prior to your arrest and transfer here? Researcher Yuji: I also understand you have continued this profession while in custody. Researcher Yuji: The report I have here indicates that you perform these services for not only other D-Class personnel, but also some of the security staff. You must understand that this is a breach of multiple security protocols. Researcher Yuji: … Very well. Before your incarceration, have any of your clients displayed anomalous behaviours? Researcher Yuji pauses for 10 seconds and looks down at his papers. Researcher Yuji: What is the nature of your relationship with D-4423? D-8779: Tadahashi has been my client a number of times. Researcher Yuji: And that is all? Researcher Yuji: His statement in our last interview implied otherwise. D-8779, I am sure you understand that this process is facilitated by giving me truthful responses to my questions. If you and D-4423 are lovers it may be a vital part of the anomalous process we have identified, and it is similarly vital that it is documented. D-8779 does not initially respond. Video footage shows D-8779 adopting defensive body language and refusing to meet Researcher Yuji's eye. Researcher Yuji: Very well. Perhaps at another date. The last questions I have to ask you are regarding the nature of your instruments, your tebori. Security obtained this from your cell. How did you come by the materials for these objects? Researcher Yuji places a bag on the table containing tattooing implements used by D-8779. D-8779: Perhaps you should spend less time investigating my relationships and more time watching your cameras. D-8779 refuses to respond further beyond this point. Researcher Yuji terminates interview. After further interviews with A and B, and preliminary analytical testing on SCP-3253-C Researcher Yuji submitted his initial report, concluding that none of the three objects were themselves inherently anomalous, but only became anomalous when brought together. The phenomenon was granted classification SCP-3253 and permission was granted for further testing. Extracts from the testing logs are reproduced below. Subject: D-4423 (SCP-3253-A), D-8779 (SCP-3253-B), SCP-3253-C, one (1) rabbit. Procedure: D-4423 was seated and secured opposite a caged white rabbit. D-8879 was made to tattoo an image of the rabbit on D-4423 using SCP-3253-C. Subjects coerced to proceed despite initial noncooperation. Process lasts four hours. At the precise instant D-8779 considers the tattoo to be complete, the rabbit disappears from the cage. Disappearance observed to be instantaneous. Analysis of individual frames of security footage show the exact disappearance occurs at 14:43:23, with the rabbit disappearing on the 23rd frame of that second. Conclusion: Test proves that SCP-3253 is reproducible. Recommendation: Further testing should be undertaken to prove Researcher Yuji's hypotheses about the linked nature of SCP-3253-A, -B and -C.
Subsequent testing (Experiments 02-04) confirms the need for all three parts of SCP-3253 to be present and used for the anomaly to manifest. Subject: D-4423 (SCP-3253-A), D-8779 (SCP-3253-B), SCP-3253-C, one (1) mouse. Procedure: D-4423 was blindfolded and given earplugs. After ensuring that D-4423 could neither see nor hear anything, a caged mouse was brought into the room and D-8779 was made to tattoo an image of the mouse on D-4423. The mouse did not disappear when the tattoo was completed. Conclusion: Test indicates that SCP-3253-A must be aware of the subject for the anomalous effect to occur. Subject: D-4423 (SCP-3253-A), D-8779 (SCP-3253-B), SCP-3253-C, D-5754. Procedure: D-4423 was seated and secured opposite D-5754, an adult female of Latin-American origin. D-8779 was requested to work with D-4423 to create a symbolic image representing D-5754, and to then tattoo that image onto D-4423. The image was requested to be no larger than 5cm x 5cm and to be placed on D-4423's right wrist. The intent was to observe SCP-3253's effect on a non-anomalous sentient being in preparation for further testing. Both D-4423 and D-8779 refuse to co-operate with the test. Security personnel subdue D-8779, and in doing so harm him. D-4423 pleads with security personnel and agrees to undergo testing, despite D-8779's continued refusal. D-8779 is taken away and the test abandoned. Procedure: This experiment was intended to complete the test attempted previously. D-4423 and D-8779 discuss in Japanese the form the tattoo should take, settling on a design after twenty-three minutes. Once the outline is completed, D-5754 falls unconscious. D-8779 pauses work, but is urged to continue once it is determined by Researcher Yuji that D-5754 is still alive. D-5754 disappears from the room as expected when the tattoo is completed, although her clothes remain. Conclusion: SCP-3253 can potentially be utilized in the containment of anomalous objects or entities. Further testing scheduled. Procedure: D-4423 was subjected to laser tattoo removal to remove the image created in Experiment 07. D-4423 is initially unwilling to undergo the process, but is convinced by Researcher Yuji. When the process begins, D-4423 exclaims in pain and interrupts the procedure. He describes the sensation as similar to being shot, and that the pain is concentrated at the forehead. Researcher Yuji calls a temporary halt to testing. D-4423 is relocated to a medical facility on site where he is placed in to a combined EEG/MRI instrument and the test is resumed. D-4423 continues to experience extreme sensations of pain until he passes out two minutes into the procedure. EEG data indicates abnormal activity in the frontal lobes throughout the process. When the removal is complete, a corpse suffering what appear to be third-degree burns across 100% of their body appears in the room. DNA testing is partial but indicates that the body is that of D-5754. D-4423 is removed from the room and regains consciousness three hours later. Conclusion: Removing the tattoo reverses the effect of SCP-3253, but with unexpected consequences. Other means of removal should be tested. Procedure: D-4423 was anaesthetised and the tattoo of the rabbit from Experiment 01 was surgically removed via removal of the dermis and epidermis of the affected area. Fresh skin was transplanted from a donor to replace that taken. No effect is observed in the room when the skin is completely removed. The removed skin is placed on ice and kept in storage. Conclusion: Merely removing the skin but leaving the image intact did not reverse SCP-3253. It is therefore hypothesized that the effect of SCP-3253 is only reversed when the image is destroyed. Subject: Section of skin removed from SCP-3253-A in Experiment 09. Procedure: The skin is flash frozen with liquid nitrogen and shattered with a blow from a hammer. Immediately, fractured and frozen fur, skin, bone and viscera appear in the room. The appearance of the fur and total mass is consistent with that of the rabbit from Experiment 01. Conclusion: Destroying the image reverses SCP-3253 but induces a sympathetic effect in the subject of the original image. Subject: Section of skin removed from SCP-3253-A, depicting a bird. Procedure: SCP-3253-B was made to tattoo an image of a bird on SCP-3253-A. Once the bird had disappeared, the image was surgically removed from SCP-3253-A and desiccated. When the moisture content of the section of skin reached <1%, the desiccated body of the bird appeared in the room. Conclusion: At this time, the only way to reverse SCP-3253 seems to be detrimental to the subject of the image. Further testing was suspended after Experiment 11. Researcher Yuji's proposal for a series of tests that would enable SCP-3253 to be utilized in the containment of objects classified Safe was under consideration by senior staff until the occurrence of Incident 3253-3 on ██/██/20██. A summary of the key events is included below. On 14/08/20██ SCP-3253-A was admitted to emergency medical care at Site-██, suffering severe blood loss arising the self-amputation of its left forearm. After two hours of emergency medical treatment, A was stabilized, although unconscious. Also detained was one Jeffrey Garrett, a member of Site-██ security who, it was found, had been in close contact with A and B for over three months in the course of his duties. An internal tribunal heard how Mr Garrett had obtained a meat cleaver from Site-██'s kitchens, from an acquaintance on the catering staff, Fariha Layan Asfour. Ms Asfour and Mr Garrett both expressed sympathy for A and B, who, they claim, had 'suffered too much'. Mr Garrett admitted that he had severed A's left forearm at its request, and had then called for medical aid to prevent A's death. A's forearm, containing the tattoo of SCP-████, was recovered from its cell and placed in cold storage to prevent containment loss of SCP-████. Upon recovery, A was interviewed and it became apparent that despite monthly psychological profiling overseen by Researcher Yuji, none of the reports had been filed with Site-██ medical staff. It was therefore not noticed that A was suffering from depression and paranoia regarding SCP-████. Researcher Yuji was questioned and admitted failing to file the psychological reports. He justified his actions by stating his belief that 'the SCP-3253 project was potentially too valuable a tool to let the Ethics Committee put a stop to it'. Researcher Yuji was reassigned to Site-36 and continues to be under scrutiny by the Ethics Committee for possible future breaches of trust. After A had recovered, Site-██ Administration decided that the continued safe containment of SCP-████ was of paramount importance, and requested that its image be once again tattooed onto A, as a safeguard in case its severed forearm was no longer sufficient means of containment. The proceedings form Incident 3253-4. On 07/01/20██ SCP-3253-B was requested to tattoo the image of SCP-████ back onto SCP-3253-A. A and B were both emotionally distraught at the time of the procedure. At the beginning of security footage relevant to Incident 3253-4, A and B can be seen conversing in Japanese. They are both upset and exchange apologies and comfort to each other for past events. After two minutes, B is urged to continue with the procedure. It is at this point that B can be seen to pause and stare at SCP-3253-C, with body language indicating revulsion of the object. B is once more heard to apologize, and bids A before swiftly bringing C to its temple and embedding it in the region of the pterion. B immediately collapses to the ground and loses consciousness as A screams and rushes to cradle B. Security personnel intervene and pull A and B apart, before sending B to site medical care. A is subdued and returned to its cell. B has not recovered consciousness since Incident 3253-4 and remains on life support. A's mental state was observed to rapidly degrade following Incident 3253-4 and it now remains mostly non-responsive to site personnel. A is kept under constant watch for the formation of nervous behaviours. The Ethics Committee deliberated on 20/05/20██ that A be allowed weekly visitation with B, provided the visitation time does not exceed one hour and that both are kept under constant supervision. As B remains in a coma and is considered unlikely to awake in the immediate future, Site-██ Administration have reclassified SCP-3253 as Safe.